Mark Dunaway says he flew the flag for 10 years before complaints. camera (Marc Leibowitz/Twitter) A New Jersey resident posted a photo to Twitter of what he thought appeared to be an ISIS flag. 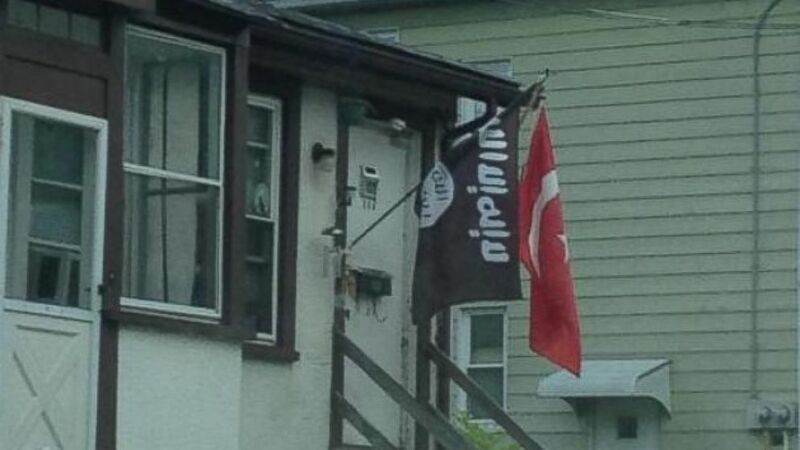 A photo of a New Jersey home flying a flag that resembled the flag of ISIS, the militant group being bombed by U.S. planes in Iraq, sparked alarm and a complaint to the Department of Homeland Security -- but the home's occupant said he meant no offense and was just expressing his religion. Mark Dunaway told ABC News that he's flown that black flag for the 10 years he’s lived in Garwood, New Jersey. “I’m Muslim, and I fly a flag in front of my home that says I’m a Muslim,” he said. Dunaway has flown the black flag -- which bears the Arabic inscription familiar to Muslims, “There is no God but God, and Muhammad is the messenger of God” -- every year during Ramadan, and every single Friday, he said. Having already had the flag up during Ramadan, he originally planned to keep it up until Friday. However, after the Garwood Police Department received a complaint about the flag, officers visited Dunaway's home on Tuesday. "The Garwood Police follow up with any complaint received," Police Chief Bruce Underhill said in a statement to ABC News. "Mr. Dunaway was very receptive when we approached him with our concerns and he voluntarily took the flag down," said Chief Underhill. Dunaway, surprised at the complaint, realized the extent of the controversy when he saw the photo of his home posted on Twitter. “It totally caught me off guard that someone was offended to that extent,” Dunaway said. Marc Leibowitz, who posted the photo to Twitter, told ABC News that he was sent the photo by a friend and alerted Homeland Security. Leibowitz said he doubted a member of ISIS would openly fly the flag, but that the situation was "disturbing and worth looking into," and that he "thought Homeland Security and any relevant authorities should probably be notified." Ibrahim Hooper, a spokesman for the Council on American-Islamic Relations, told ABC News the flag is different from the ISIS flag and its message is something most Muslims are familiar with. “The flag is a profession of Muslim faith,” Hooper said. Hooper added that ISIS is a relatively new organization and Dunaway's flag flying predates it. After hearing Dunaway's explanation, Leibowitz acknowledged Dunaway's First Amendment right, saying, "I don’t think he should be restricted from flying the flag, but I think it is a breach of good taste." Some residents continue to harbor negative feelings. "There have been a few threats to damage Mr. Dunaway’s residence on various social media outlets," said Chief Underhill. "This is unacceptable." Dunaway said he is Muslim, but also "American-born and -raised" and did not mean to offend anyone. He has since replaced the black flag with a San Diego Chargers flag, saying, "I just want this situation to go away."